Universal got the idea from Japan. Universal's wanted to do a Resident Evil theme maze for a while, but could never quite get a set up it liked. Then its sister park in Japan created a street environment for its Halloween Horror Night event. "It looked great," Universal's Mike Aiello says. "We loved the idea of really placing guests within the game even down to placing items (lighter, typewriter save point, herb plants) from the game randomly in our sets." Yes, there will be iconic Resident Evil moments within the maze, but from Universal and Capcom's point of view the big attraction is the maze itself; they want you to immerse yourself in the Raccoon City vibe, to become as close as you can to the game as real life can manage. There's a Pause Screen, as a kind of short break from the main action, for when everything gets a bit too much. But as soon as you've had enough of that, it's back into the nightmare. "You are walking in the footsteps of Leon and Jill! You are in Raccoon City," Aiello beams. "It completely surrounds you! Where else can you do that?" Not that it's been easy to pull off, and Aiello admits that the Alpha Hunter costume in particular was a challenge, given its size requirements. But neither he nor Capcom's Yoshiaki Hirabayashi were about to spoil anything for the fans by giving away real secrets; teasers, yes, but they want you to have all the first-hand fun you can, when you visit. 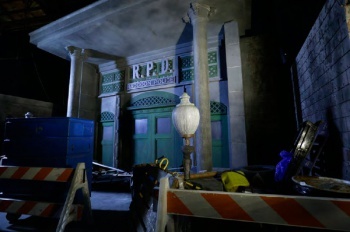 Universal Studios' Halloween Horror Nights Resident Evil: Escape from Raccoon Ciy maze will be part of Orlando's fun from September 20th to November 2nd.